Argon is a noblegas. The noble gases are the six elements in group 18 of the periodic table. Periodic table is a table that shows us the reaction of chemical elements to each other. The other name of noble gases is inert gas because the elements in group 18 react with very few elements of other groups. Argon gas was discovered in 1894 by a British chemist. Noble gases were first discovered by him and isolated from other elements. Its atomic number is 18 and its atomic weight is 39,948. Ar is the symbol of argon in the periodic table and it is a member ofthe group 18 (noble gases). Argon is used to provide an inert insulation for specific industrial operations. In the operation, the inert gas insualtor prevents the entrance of any chemicals from the oxygen reaction with other materials in the air. Argon is also used in the production of neon lamps and lasers. In 1890, when Ramsay repeated Henry experiment, he found a small amount of anonymous gases in the air, but Ramsay had an advantage over Henry that could use the spectroscopythat was not available at the time Henry lived. The argon element was discovered in 1894, but the English scientist Henry Cavendish predicted the presence of Argon 200 years ago. When Henry removed oxygen and nitrogen from the air, he found that very little amount of a gas is left. He guessed that there was another element in the air, but he was not able to identify what was left.In 1890, when Ramsay repeated Henry’s experiment, he found a small amount of anonymous gas in the air, but Ramsay had an advantage over Henry that could use the spectroscopythat was not available at the time Henry lived. The spectroscopyis a process in which the generated light from heating the element is analyzed. The spectrum created by the element contains a row of color lines that are different from other elements. Ramsay studied the spectrum created by the unknown element. He detected a series of lines that did not belong to any known element. He had to convince others that he had found a new element.Meanwhile another scientist, Riley, had done the same thing as Ramsay. He did his discovery almost at the same time with Ramsay. The two scientists decided to prove the news of their new discovery together to others. The Argon name is derived from the Greek word Argus meaning lazy. The reason for the naming is the inability of the element to react to other elements. The discovery of argon element has created a problem for chemistry! Argon was the first discovered noble gas. Where should Argon be placed in the periodic table? At that time, the periodic table was ended at the right side with the group 17. Ramsay suggested that the periodic table would require some changes. He suggested adding a new group to the table, the position of the new group is the right side of the 17th group. Ramsay’s suggestion was accepted, but a new chemistry problem was created! If a new group is added to the table … Where are the other elements belongs to it? Fortunately, chemistry has good theories and assumptions about the properties of unknown elements. All elements of thespecial group have very similar behaviors. Chemists were looking for more nobel gases. After 5 years they succeeded to find the rest members of the group: helium, krypton, neon, radon, xenon. Argon gas is a colorless, odorless, tastelessgas. Its density is 1,784 g/liter. Compared to air density, it is 1.29 g / liter. Argon gas changes to liquid state at -185.86 ° C and then changes from liquid to solid at-189.3 ° C.
Argon gas is one of the inactive chemicals. In rare cases, under certain conditions, it becomes a weakly resistant structure. The argon abundancy in the atmosphere is close to 0.93%, and its abundancy in the earth’s crust is about 4 parts per million. Argon gas can be made of liquid air by the fractional distillation, it is done by heating the nitrogen gas from the atmosphere with hot magnesium or calcium. The reaction of magnesium or calcium with nitrogen to form a nitride: Argon always occurs with nitrogen as an impurity, and it remains behind because it does not react with magnesium or calcium. Argon gas is also produced with natural gas in the well, when natural gas is pure, some argon can be recycled as a byproduct. There are three natural argon isotopes including: argon 36 and argon 38 and argon 40. Isotopes are two or more forms of an element. Isotopes act differently according to their mass number. The number written on the right side of each element is its mass number. The mass number represents the number of protons plus neutrons in the nucleus of an atom of the element. The number of protons determines the element, but the number of neutrons can vary in an element’s atom. Each changes in neutron is an isotope. 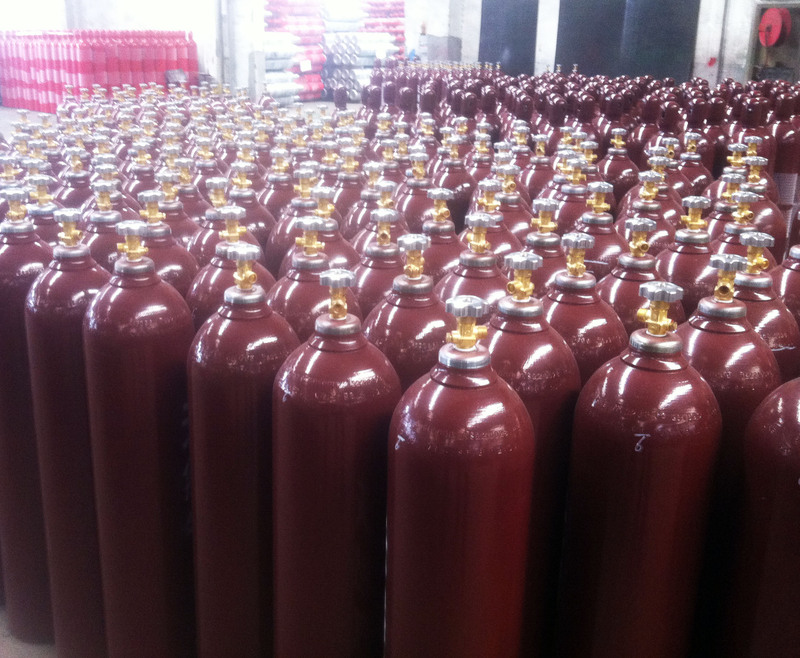 Argon is used in conditions where materials need to be protected from oxygen and other gases. A good example is the incandescent light bulbs which are consisted of a metal wire inside a bright glass bubble. The electric current passes through the wire makes it veryhotto emit light. Oxygen combinesvery easily with hot metals and produces a mixture of metal with oxygen. Thecompound does not act like a good electrical compound, therefore it stop light emmitance from the lamp. Argon is used to prevent theevent. Since argon is a still gas that does not combine and react with hot wire, it leaves hot metal for a long time. The light bulb only stops the light emmitance when the metal breaks. Then it can no longer carry electrical current. Argon is also used in welding. Welding is a process in which two metals are linked. In most cases, two metals are heated athigh temperature. Once theywarm, two metals are linked. But as the metals become warm, they start reacting with oxygen. In the reaction, the combination of metal with oxygen causes a new bond formation. The two metals link to each other is very hardly if they bind in the reaction, but the introduction of argon to the welding industry will improve the environment. Argon gas is also used for argon lasers. A laser is a device that produces very bright light from a laser frequency. Argon laser is used to treat skin diseases. The green-blue laser is reflected on the skin of the patient. The energy sent by argon is absorbed by hemoglobin and turns into heat. The positive or negative effects of argon on plants or animals are not yet known.